You'll be £25.00 closer to your next £10.00 credit when you purchase Irish Railways in the 1950s and 1960s. What's this? In the 1950s and 1960s the railway system in Ireland became a magnet for enthusiasts from Great Britain who realised that, as on the mainland, a way of life was fast disappearing as diesel traction replaced steam and the size of the rail network across Ireland was shrinking. Much of the interest stemmed from the similarity with the railways in Great Britain. Also, the existence of several narrow gauge systems, two railway-owned tramways and some cross-border operators added to the fascination. This album covers those main line and narrow gauge railways in Northern Ireland and the Republic of Ireland during the 1950s and 1960s, which were photographed in colour and the images used are believed never to have appeared in print before. Although most of the pictures depict individual locomotives or ones hauling trains, the opportunity has been taken to show some of the railway infrastructure of the period as well, since this is of particular interest to railway modellers. There has been a very active preservation movement in Ireland over the years, with many wonderful steam-hauled rail tours being operated that continue to this day, however this book will focus on the normal every day operations. 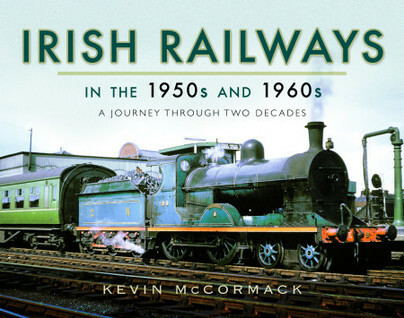 Overall this book, the first venture of an established English publisher into the Irish Railways market is to be welcomed as it taps new sources of illustration and the author is to be applauded for his approach to the subject. A masterpiece visually speaking for all those steamy and nostalgic lovers.